Take this opportunity to reward and celebrate an employee, volunteer, or community citizen who exemplifies the everyday spirit and commitment of a Star of Life. Each person nominated is presented with Wisconsin Stars of Life honors! You do not need to be a member of PAAW to submit a nomination application. All nominations are welcome. The Professional Ambulance Association of Wisconsin's Stars of Life celebration is the most rewarding and exciting Wisconsin event in our field and is modeled after the American Ambulance Association's national Stars program. 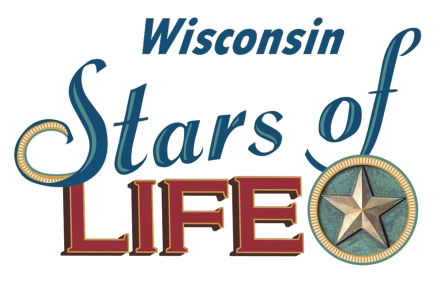 The 2019 event will be the eleventh time PAAW has proudly presented the Wisconsin Stars of Life program. This special event recognizes and honors the dedication of ambulance service professionals - people that stand out in every area of our field. You choose your "Star." These are the people who will be recognized in a series of celebratory events. The Stars of Life Award is an outstanding recruitment and retention tool! Many ambulance services face challenges recruiting and retaining valuable employees and volunteers. The Stars of Life program can be a valuable component of your organization’s efforts to recognize and reward your staff. We hope that you will consider recognizing one or more of your staff by registering them for the event. Equally important, we hope you will attend as their host. Stars of Life 2019 honorees will be recognized at a series of events, to include a welcome reception, banquet dinner and awards program and at the State Capitol, Madison. One person from the group of 2019 honorees will be selected and advance to represent Wisconsin. This individual will be recognized at the National Stars of Life program in Washington, D.C., June of 2020. PAAW will provide a $750 travel voucher, and the American Ambulance Association Foundation will provide a grant for hotel and event registration fees for the Star, Star's guest, and host (employer). Reward and congratulate outstanding ambulance service employees. Let people know that you are proud of the work they do and how hard they work to support the high standards set by your company or organization. Increase visibility of ambulance professionals with members of state and local government, community leaders, industry professionals and peers. Spend a day at the state capitol in Madison. Sit down with state legislators face-to-face educating them and their staff regarding the key role of ambulance professionals and your work as an EMS professional. The image of the members of the ambulance industry and PAAW are enhanced by generating positive media coverage statewide as well as in your local community. Nominate To nominate someone deserving of this high honor just download the >> nomination packet. Each person nominated is presented Stars of Life honors. The deadline to submit the nomination packet is sometime in 2019 (date TBD). “I was extremely honored to be recognized as a 2010 ‘Star of Life’. It was an honor that I never expected to receive, but I am very proud to say that I was recognized in such a manner. EMTs are usually very ordinary people but are extraordinary in some ways. One of the ways we seem ‘special’ is that we don’t look for a spotlight for what we do. Just knowing we’ve made a difference in a patient’s life during a stressful time is ‘thanks’ enough. At least it always has been for me. "Being recognized as a 2011 Star of Life was a very overwhelming and humbling experience all at the same time. This really has been a highlight of my EMS career." "It was such a tremendous privilege to be able to partake in the STARS ceremony. I felt so honored to receive this wonderful award. I was overwhelmed by everything PAAW and the AAA presented to make it such a wonderful evening. This was one of the greatest honors I’ve ever had. I do believe there is no other profession deserving of the respect and admiration than those of the EMS profession. These individuals give selflessly time after time and merit the honor attached to this prestigious award."